Forty adventure seekers including top corporate professionals from around the world have taken on an eight-day trip by tuk tuk across Sri Lanka – all in the name of charity. The travellers who began the excursion in Jaffna on 18 September arrived at the Lantern Boutique Hotel in Matara on 24 September before visiting the Foundation of Goodness (FOG) in Seenigama. The event titled ‘PMTT 2015’ combines two remarkable aspects – an avid appreciation for Sri Lanka’s bountiful offerings and a selection of worthy charitable causes. PMTT 2015, inspired by the success of a previous leg held in India in 2013, is organised by the PMTT Challenge Team in Singapore in partnership with the Foundation of Goodness in Sri Lanka. Sri Lanka (recently named ‘Destination of the Year’ by Sunday Times UK) is a top tourist destination for travellers seeking adventure, variety and warm hospitality. Most will have taken a quick ride by ‘tuk tuk’, a three-wheeled mode of transport known for its convenience and speed. Thus 40 high profile executives took on the challenging and undoubtedly exciting task of seeing the island from the perspective of a tuk tuk driver. Twenty three-wheelers were commissioned for the task of travelling across Sri Lanka starting from Jaffna, to Anuradhapura, Trincomalee, Batticaloa, Kandy, Ratnapura and Matara, then onto the Foundation of Goodness in Seenigama and later Hikkaduwa and finally Colombo. Along the way they partook in several voluntary activities-visiting orphanages and elders’ homes, opening a reverse osmosis plant, and meeting schoolchildren. In Matara, they stayed at five star boutique hotel Lantern, where the team’s arrival was marked with an elegant cocktail event to celebrate their initiative. Lantern is a supporting partner for the event. Pradeep also noted that Sri Lanka needed to consider alternative approaches when it comes to meeting rivalry from an increasingly competitive tourism industry worldwide. Initiatives such as the PMTT Charitable Tuk Tuk Run are “perfectly poised to attract adventurous travellers seeking unusual and fulfilling holidays,” he said. 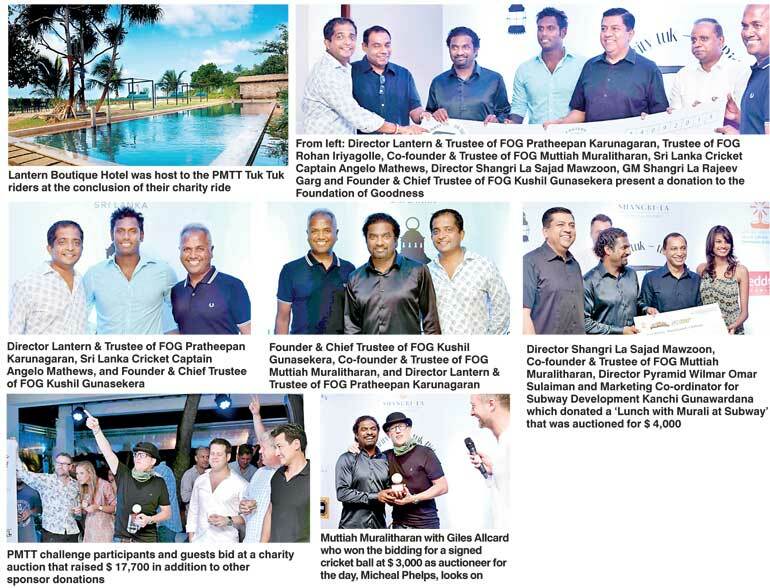 The event at Lantern was further supported by Shangri-La Hotels and Resorts, One Galle Face, Red Dot Tours, and Southern Construction & Engineering and Haya Gallery.